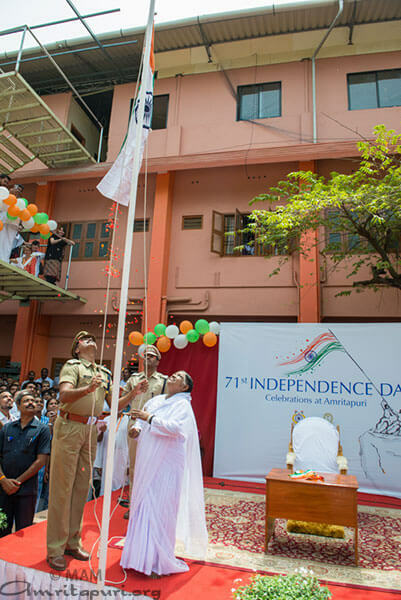 India’s Independence day was celebrated today in Amritapuri. 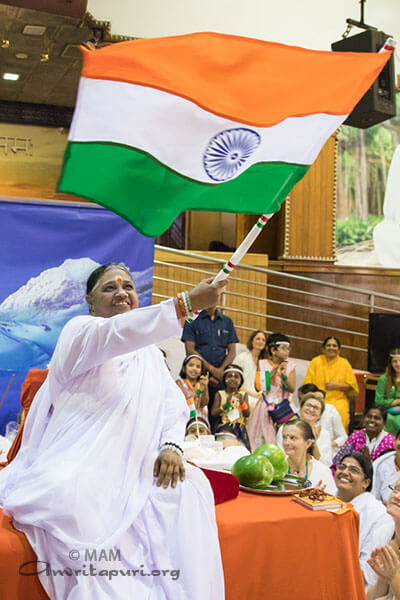 To begin the celebrations, Amma helped raise the Indian flag and all gathered around to salute it while the national anthem was played. 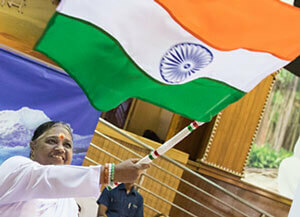 Remarking on the occasion, Amma said ‘It’s not enough to simply wave a flag, everyone has to love their country, and should have the love for their motherland. 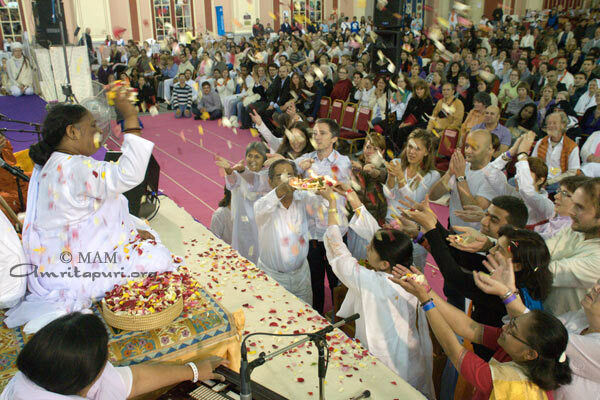 All the nations of the world are just created by us. 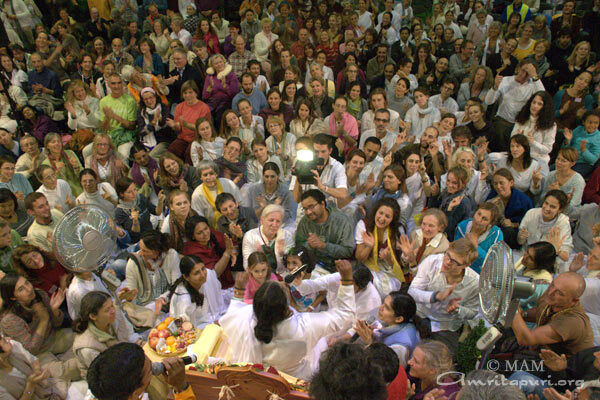 We have a role to play and a dharma towards our country. 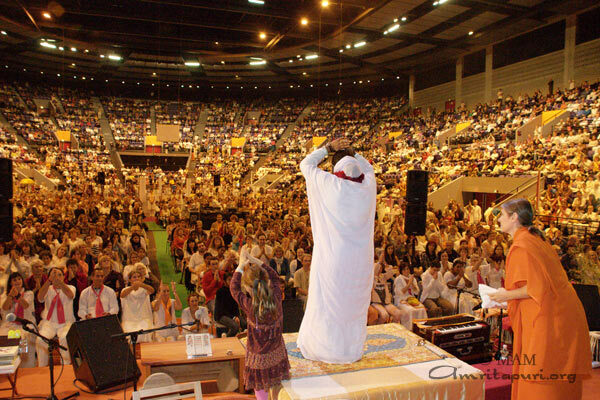 When you have an expansive mind, you will never invade or exploit another nation. 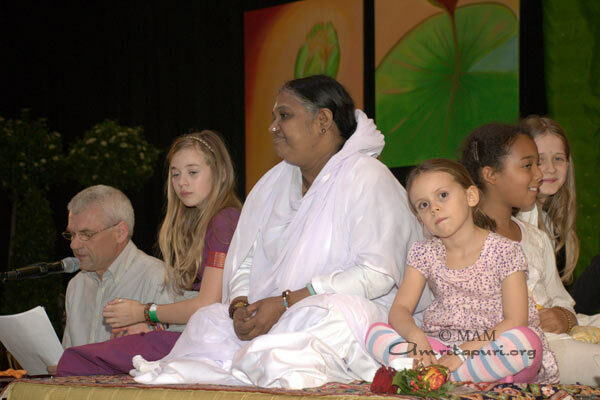 We have to develop love and compassion for this awareness to grow. 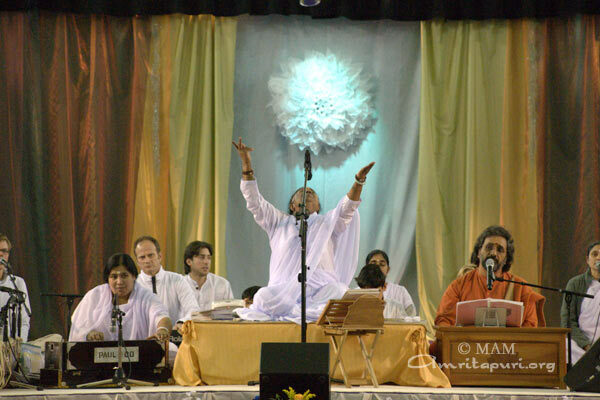 Even though our country became free, are we really free from the clutches of our mind? 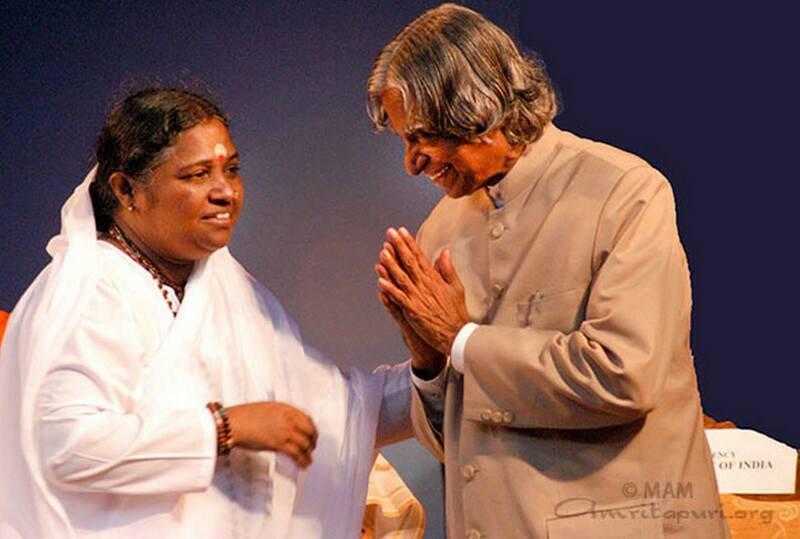 Let’s consider two birds living in a cage. 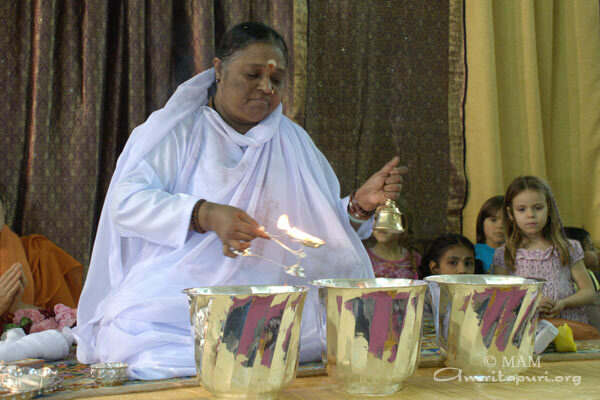 They get good food and water in time. 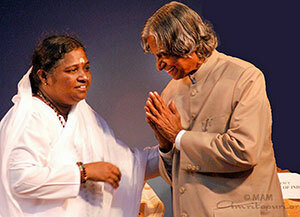 Also, they mutually share stories and love. 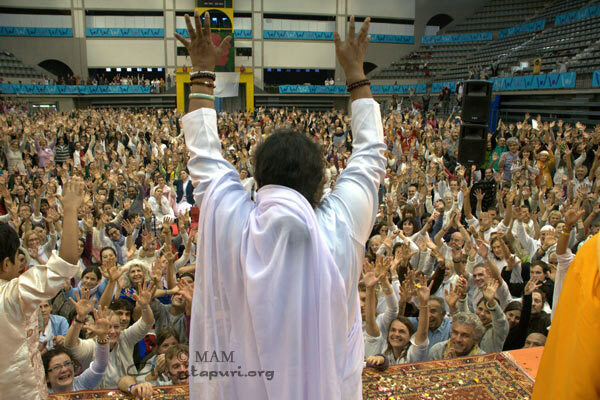 But they lose the freedom of flying in the open sky. 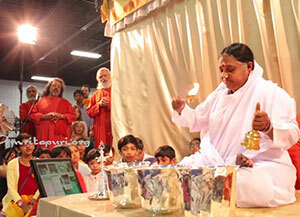 Amma held two days of programs in Washington DC., the Capital of the United States. 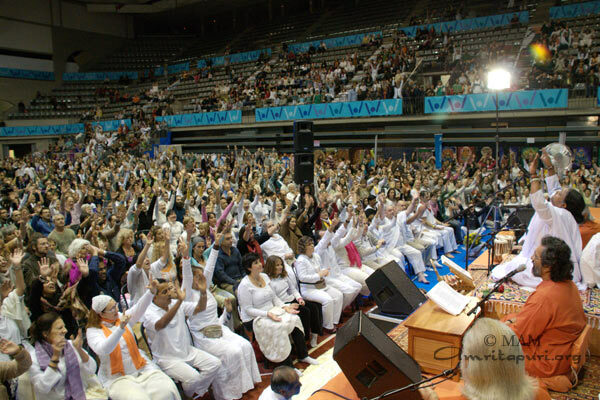 Devotees from around the region who had been waiting for almost a year came to the Marriott Gateway Hotel in Crystal City, Arlington, just across the Potomac River from the National Mall, where the Washington Monument, US Capitol, and White House are located. 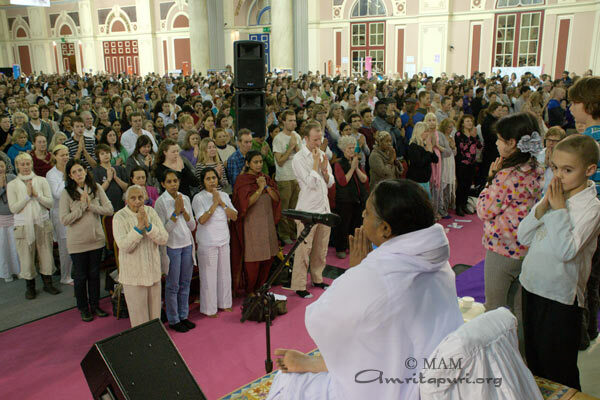 Amma sang bhajans, gave satsang, and led the gathered crowd in a prayer for world peace and harmony. 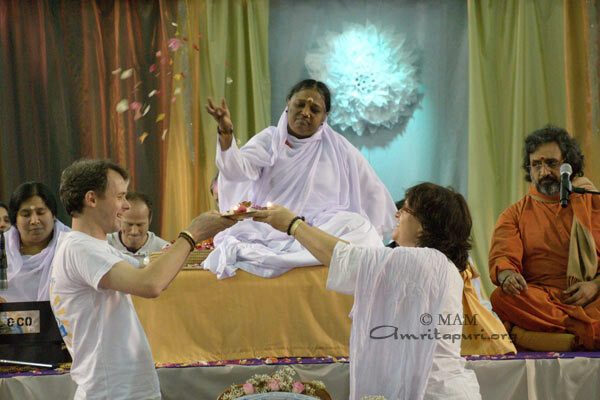 While Amma was giving darshan, local devotees sang bhajans and performed traditional Indian dances. 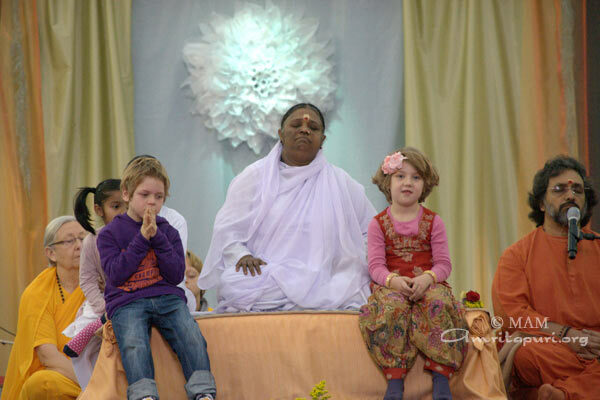 Amma concluded her 2015 North American tour with one public program and a retreat at the International Plaza Hotel in Toronto, Canada. 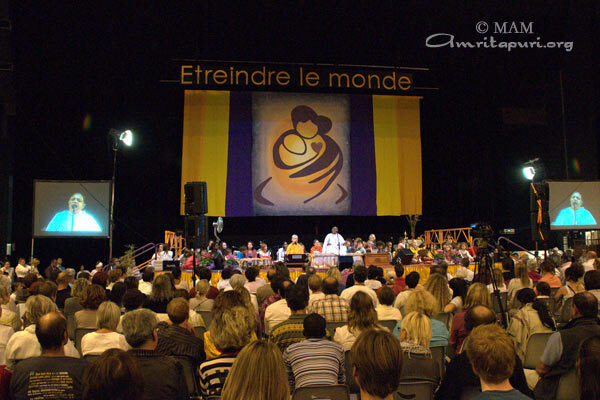 People came from all over Canada to attend the programs. 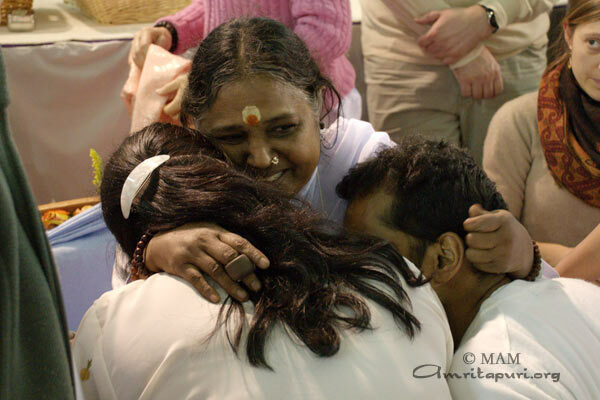 Following Amma’s message of helping those in need, the Amma Foundation of Canada, in conjunction with the Peel Children’s Aid Foundation, provided bursaries to three students in Canada to attend University. 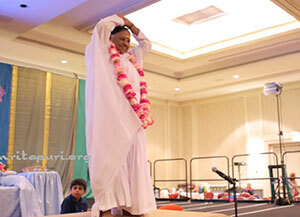 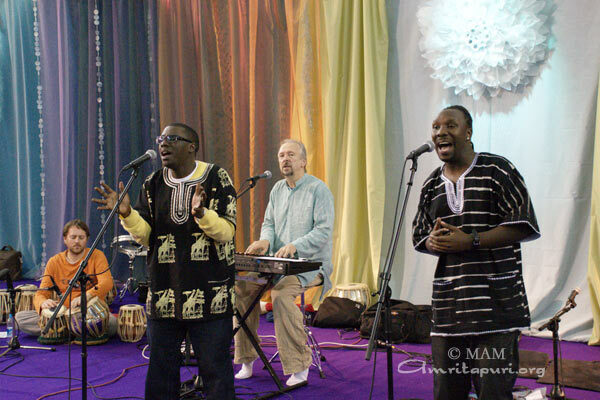 During the retreat, there were many cultural performances by Amma’s children. 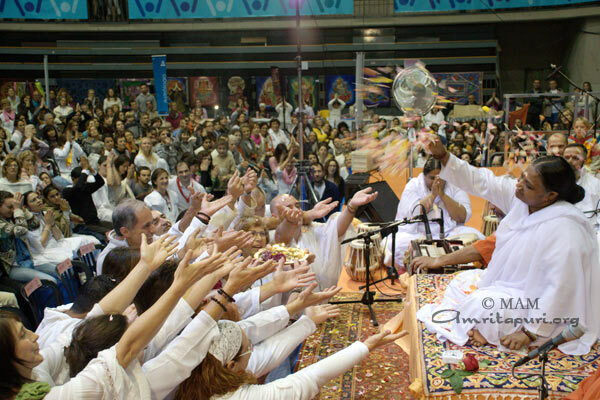 Members of Amma’s AYUDH youth group performed an impeccably-choreographed traditional Indian dance praising Lord Shiva, accompanied by musicians and singers. 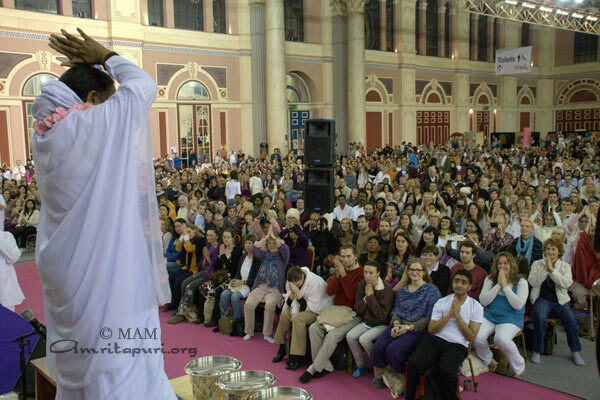 Later, three young devotees presented a sign-language version of the bhajan ‘Wondrous Goddess, Precious Goddess.’ Amma and the crowd were delighted by the heart-warming performance. 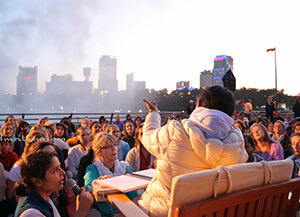 On her way to Toronto, Amma stopped at Niagara Falls along with the Tour Staff . 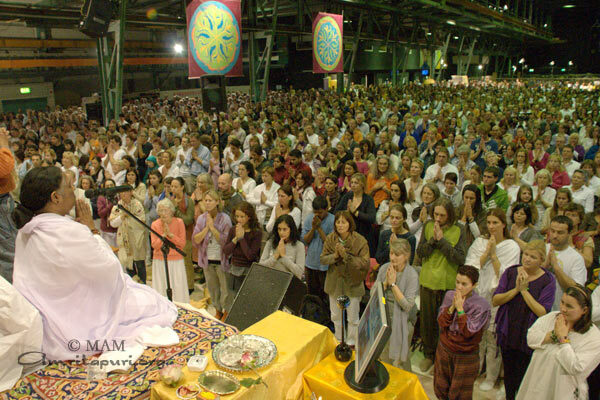 There, she served dinner to everyone, and led the staff in meditation for world peace. 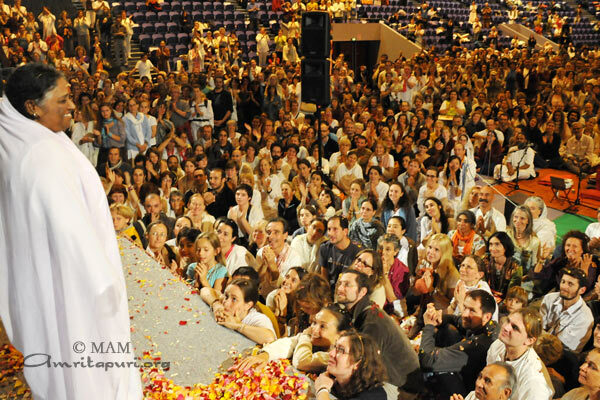 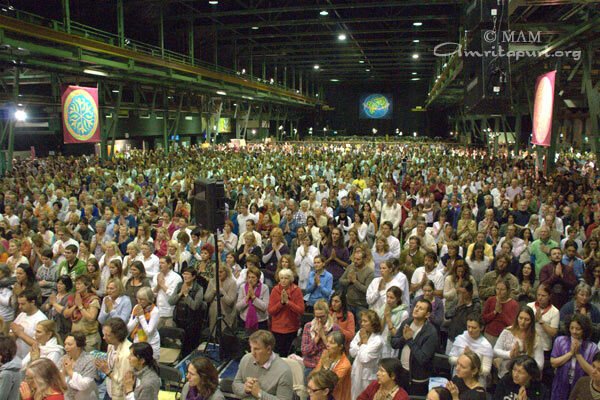 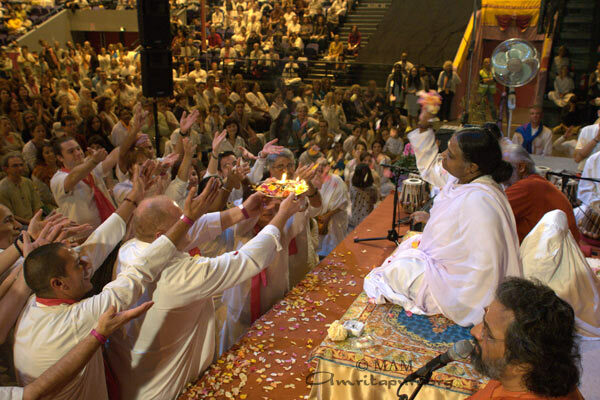 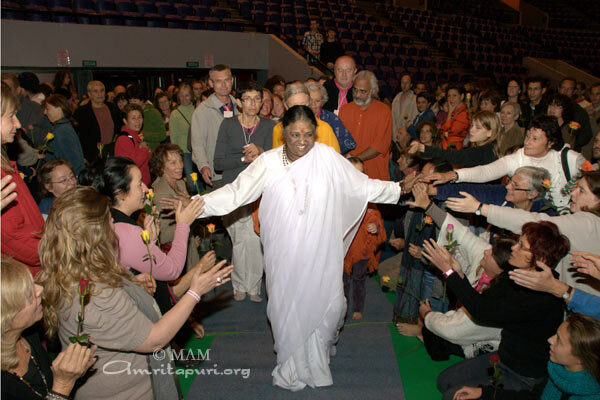 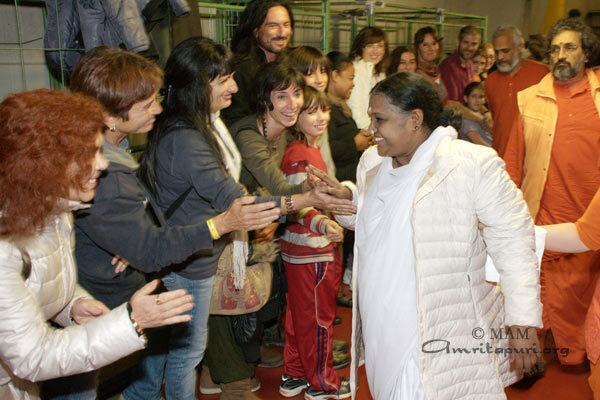 Before traveling to London to conclude her 25th European Tour, Amma visited her center near Antwerp, Belgium. 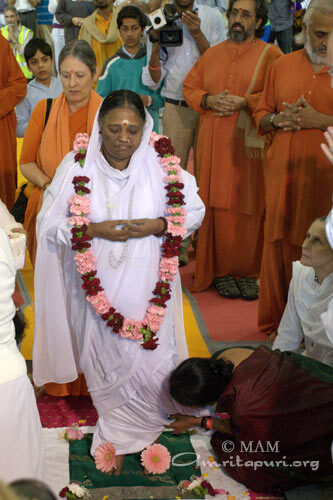 She spent the day there with local devotees and served a prasad lunch. 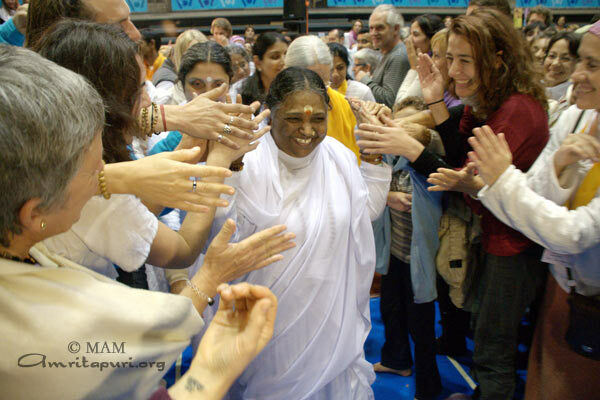 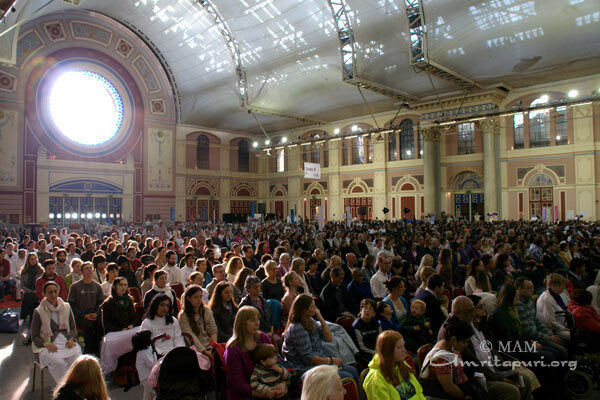 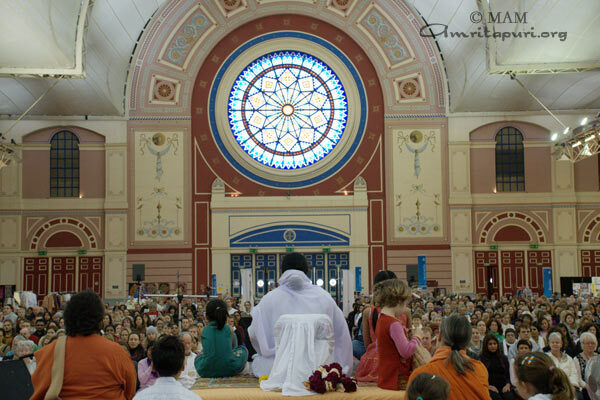 From there Amma continued on to the United Kingdom and conducted a 3 day program in London, where thousands queued for long hours to receive an embrace at the historic Alexandra Palace. 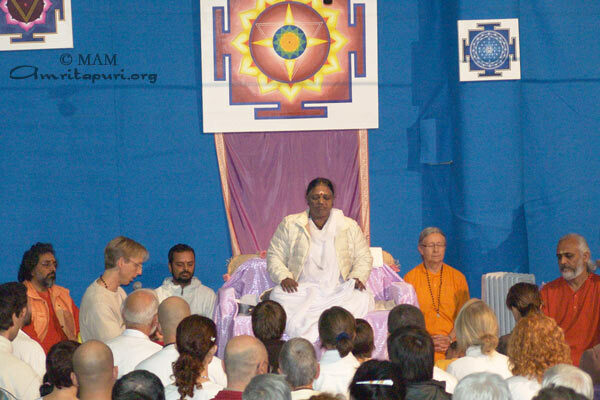 Meditations, Bhajans and Satsangs were held, along with a Puja conducted for world peace. 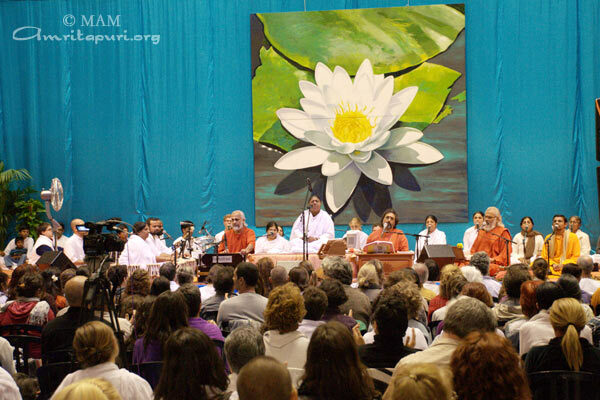 There was an extensive media presence during the programs. 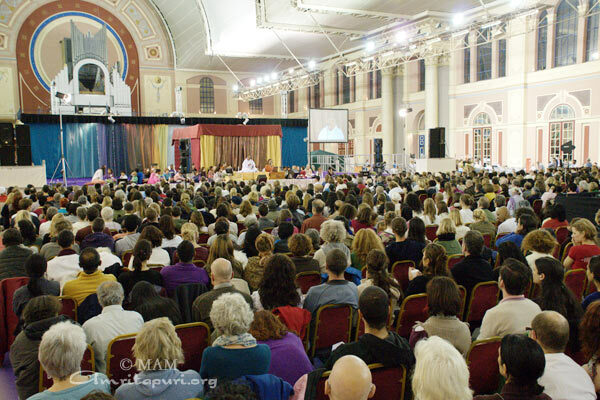 Amma’s visit was covered by almost all major media outlets including the BBC, The Telegraph, and The Sun. 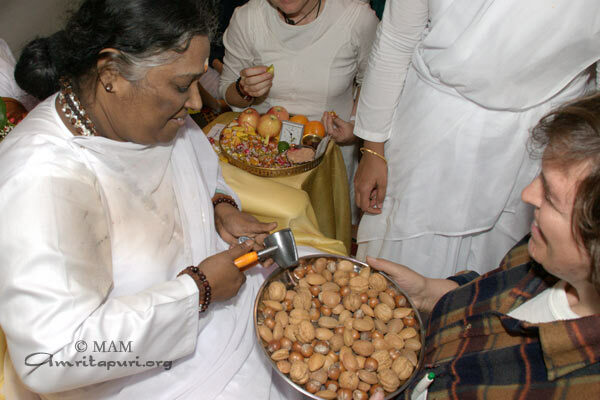 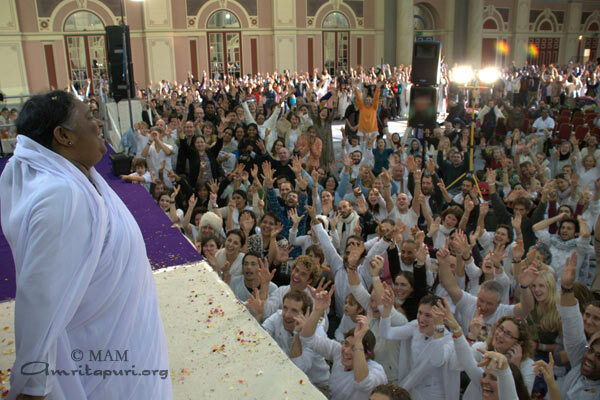 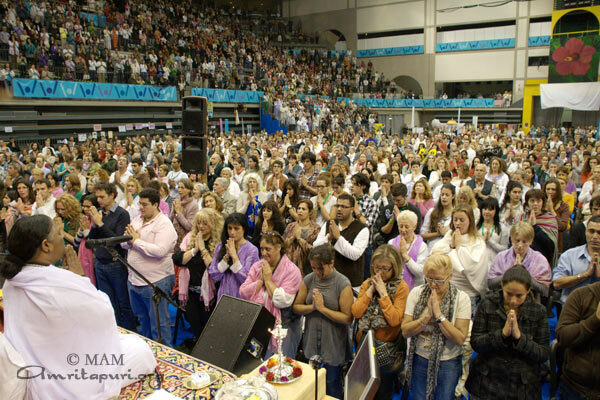 Amma began her visit to Spain by spending a day in the Barcelona Ashram and inviting all of the devotees there for lunch. 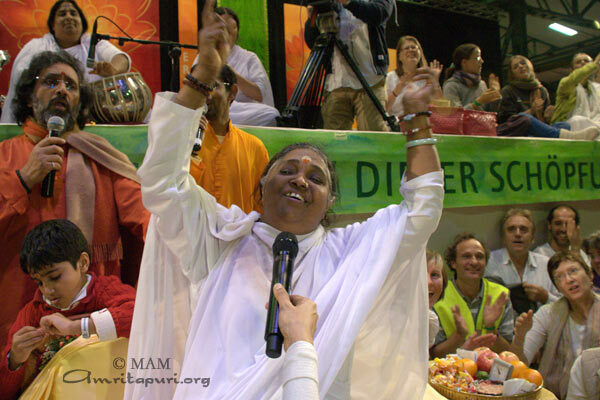 Before serving the meal Amma delighted all the devotees present when she lead the beginning of the guided meditation in Spanish. 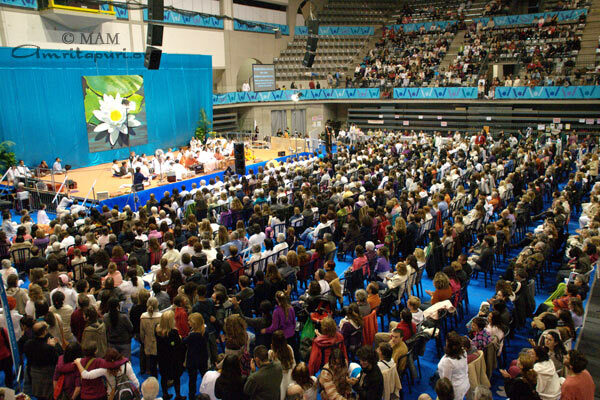 The following three days, large crowds filled the Palau d’Esport hall in Granollers, Barcelona. 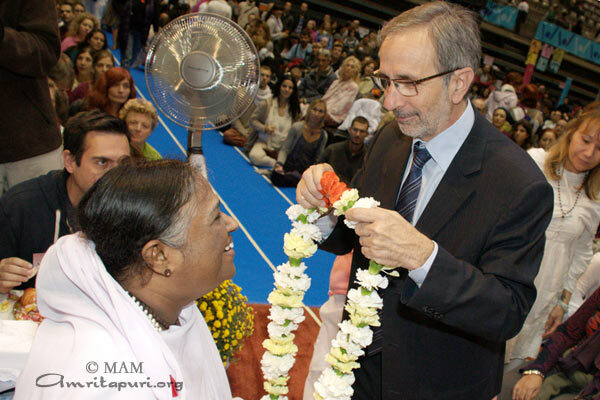 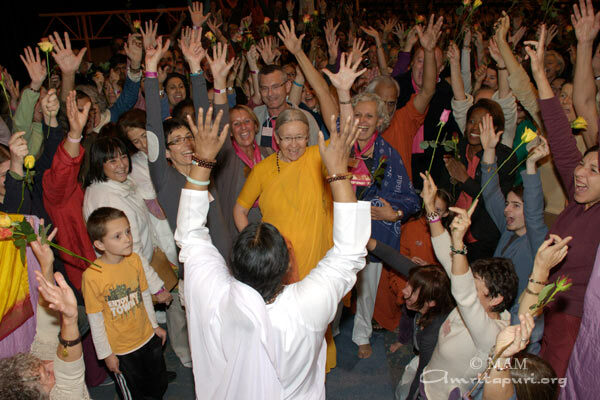 Amma’s annual visit to the south of France once again brought her to the Zenith Omega hall in Toulon. 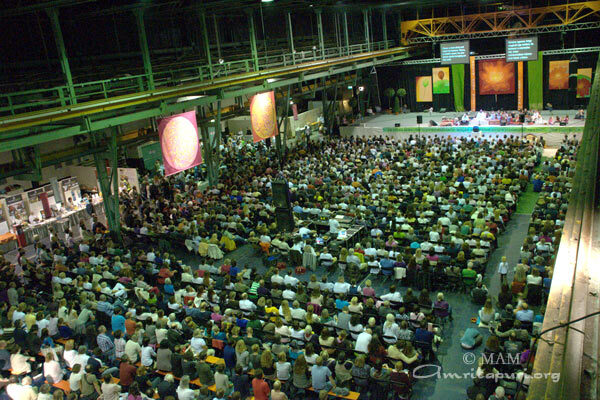 Huge crowds filled the venue for the three days for programs there. 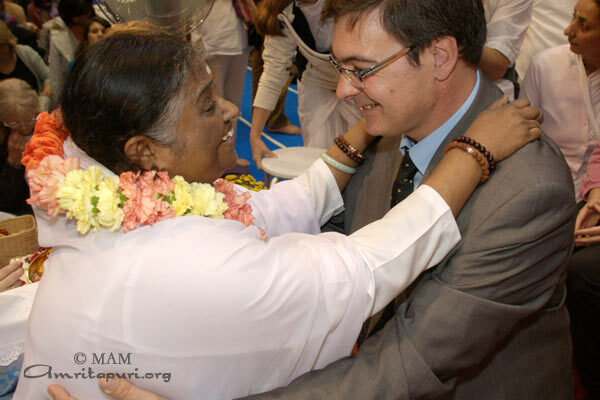 Amma’s message of love and hope continue to inspire the people around the world in profound ways. 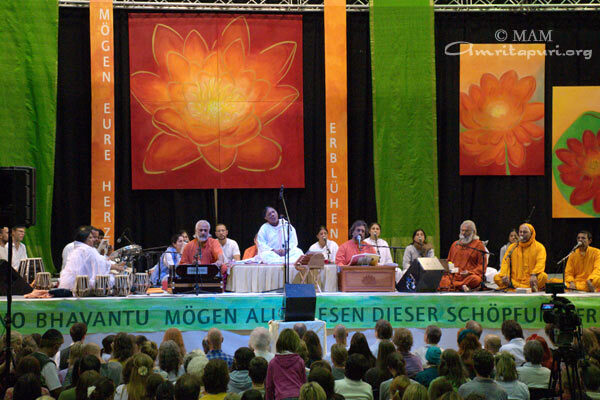 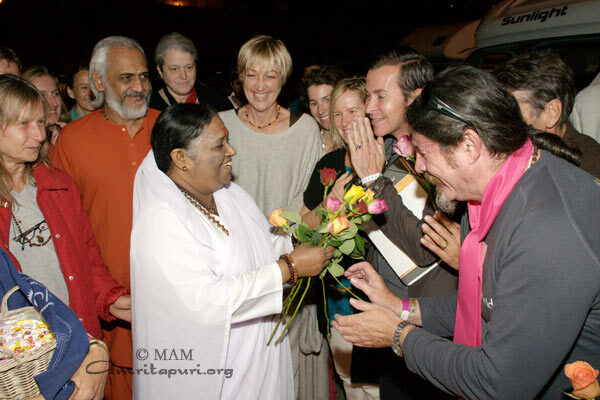 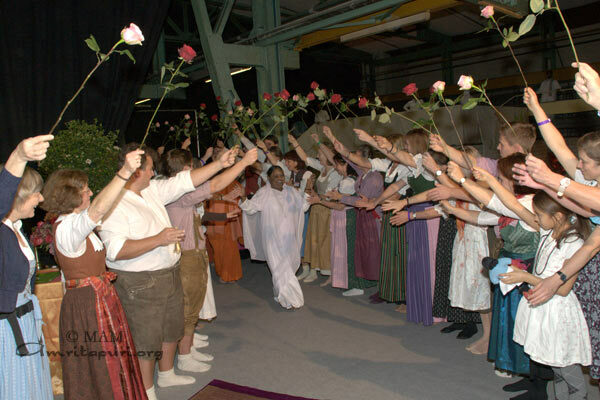 Amma was welcomed to Munich in a traditional Bavarian fashion, as devotees lined up in lederhosen and dirndl outfits and played folk music as she walked under throngs of roses. 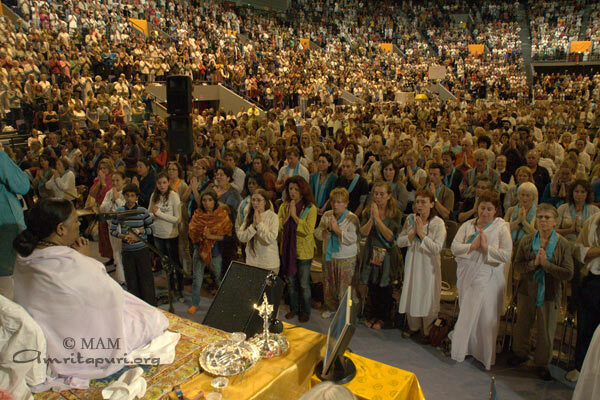 During the programs large crowds filled the Zenith Halle to capacity on each of the three days. 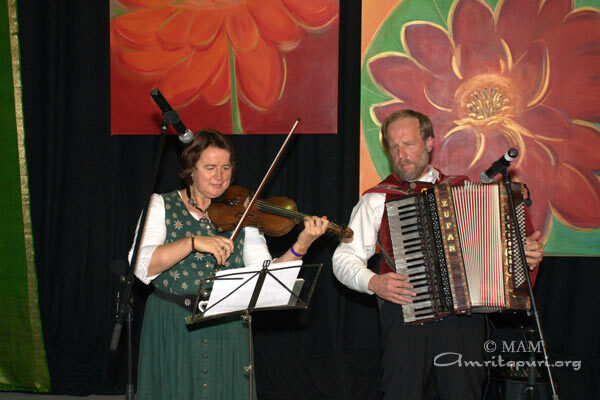 Among those in attendance included Maria Furtwangler-Burda, the well known German actress.